Often, we like to move fast from crucifixion on Good Friday to a joyful Easter Sunday. We often hear the proclamation of the Resurrection on Friday which is appropriate because the hour of death is the hour of glory in John’s Gospel. But why not stop and reflect on the pain that Jesus experienced? The pain that did not end on the cross and it is continuing to this day. It is our pain today accompanied with hope and joy of not being alone on this way of the Cross. We should ponder what Jesus suffered if we ever hope to fathom the salvation. On Good Friday, we walk with Jesus remembering his life and his preaching. We come to realize that everything he did deserves respect, recognition and love in return, but that was not the case. Jesus experienced difficult days that led to his crucifixion. The four Gospels describe in length the torture that led to Golgotha and the pain Jesus underwent before and while on the Cross. Jesus was treated unjustly, suffered the betrayal of his friends, abandoned by his followers, rejected by people, falsely accused, mocked and abused. The end of all this torture was crucifixion and a mockery when they put the words “Jesus of Nazareth, the King of the Jews” on the cross (John 19: 19). In the summer of 2014, we lived some of what Jesus experienced on his last days and on the cross. ISIS entered Iraq and targeted Christians specifically. The letter “N” (for Nazarene) was put on the houses of Christians. On the Cross, Jesus was given a title and the Oriental Christians in Iraq were also given a title. While ISIS, like the soldiers in the gospel, meant mockery by the title or letter, but it became for Christians an honor. This little letter changed the Christian’s life and future in Iraq and cost the Christians a heavy price, it cost them their years of hard work. In short time, they were stripped of everything they had. Christians were rejected and betrayed by their friends and neighbors and nobody defended them. Christians were forced to leave while some being mocked and abused because we refused to betray Jesus. The Crosses in churches and homes were destroyed by ISIS. The result was displacement of all Christians from Nineveh plain and Mosul to other cities. There many experienced hunger and thirst and lack of basic needs, but knowing that we are persecuted because of our belief gave us power and hope in the Cross. The gospels tell us that at the foot of the Cross, different groups of people stand for opposite reasons. There are the soldiers who crucified Jesus, divided his tunic and waited for Jesus’ death (John 19: 24). And there also stands Mary and the other women with the beloved disciple who mourned Jesus’ dying (John 19: 25- 26). These loyal disciples are role models to the believers who chose to stand firmly at the foot of the cross. There Jesus gives his mother to his beloved disciple. On the Cross, death and new life meets. Golgotha is the place of birth of a new community (John 19: 27). Before Jesus dies on the cross, Jesus gives his mother to one of his disciples; he gives her a new maternal role based on friendship ties and a new community. I cannot help but think of those from all over the world who offered their support to the Christians in Iraq and Syria giving what they can so that the mission of the church in these centuries continues and they may stay alive. Those supporting us are like Mary and the women and beloved disciple. We were not alone. Unlike Jesus, who accepted the pain for our salvation, for many of us who faced persecution, we found ourselves asking the questions “Why us? And where is God?” It was difficult to accept the fact of losing everything and being betrayed. Gradually, a new stronger community was born. We understood that this situation is purifying us and the pain is making us better people if we choose. Not owning anything taught us to depend on God. We arrived at a crossroads in life and we had to choose either life that includes suffering for the sake of him who gave us his life or chose death and betray Jesus. To move from pain and suffering to joy, we have to go through death so that we can live with Jesus. The good news is that he is with us and among us even when it seems hard to believe in anything. 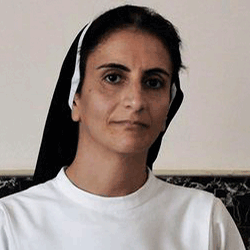 Sr. Luma Khudher is an Iraqi Dominican Sister of Catherine of Siena- Iraq. She received her Master’s degree from Catholic Theological Union and a Doctorate from Notre Dame University --both in Biblical Studies. She teaches at Babel College for Philosophy and Theology in Iraq and gives courses at CTU in Chicago and Ecole Biblique in Jerusalem. In the summer of 2014, she was forced to leave her town with her community and all the Christians due to the advance of ISIS (Islamic State of Iraq and the Levant) to the Christian towns in Nineveh Plain and Mosul. Since the displacement, along with teaching, she and her community work with internally displaced person (IDPs) in Erbil and Duhok, helping Christians in various ways.